Cheers erupted when the beautiful blue bowl of beet salad arrived. The beet salad has already established a fan group. 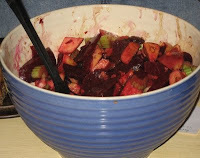 The June 15 beet salad, however, packed considerable surprise: apples, celery, and .... drum roll .... a stunning curry vinaigrette. We had 19 quality Supperians this week - the smallest group ever, including, as always, some people attending a Supper for the first time. The conversations, the tastes of all the foods, and the pace, and possibly the high ratio of bottles of wine to humans, all gave the evening a special character. 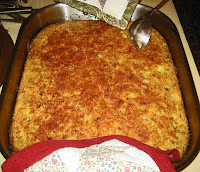 Cornbreads for the night included a green chili onion cottage cheese Parmesan casserole and some overly soft lemon blueberry cornmeal muffins. Other foods included slow-cooked black beans with Elmwood kale, a noodle dish, and an array of salads. 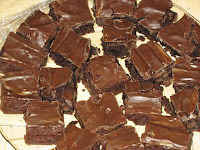 Lovely mint-flavored brownies with a light icing, and a large bowl of beautiful crunchy-fresh grapes finished the meal and delighted adults and children alike.